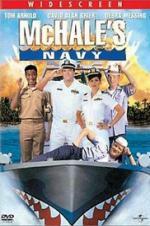 Buy or Rent McHale's Navy (1997) Movie DVD & BluRay Online! Movie Plot: Retired Lieutenant Commander Quinton McHale spends his days puttering around the Caribbean in the old PT-73 selling homebrew, ice cream, and swimsuit calendars. He’s brought out of retirement when his old nemesis turned the second best terrorist in the world, Major Vladikov, takes over the island of San Moreno and starts building a nuclear launch silo on it. With help from his old crew and hindrances from Captain Wallace B. Binghampton, who sank a cruise liner a while back, McHale tries to put Vladikov out of business.